In 1983, John Sullivan believed that he could provide the East Pennsboro community with a superior service at a reasonable price. He ventured on his own by establishing the Sullivan Funeral Home... and the rest is history. John became well known in the community as a leader and supporter of township events. John Sullivan, our founder, passed away on March 16, 2015. John was a U. S. Air Force Veteran serving during the Vietnam War. His caring nature and emphasis on providing the best possible service to the families he served was a testament to the funeral home's mission statement: "Treat others as we would like to be treated." John's wife, Nancy Sullivan is responsible for many facets of our success as a funeral home. For years she was the funeral home florist providing breathtaking casket sprays and floral pieces. Many families compliment Nancy on her interior design of the funeral home giving it a "homey" feel. Nancy resides in Enola and continues her husband's dedicated work to the funeral home. As the Sullivan Funeral Home continued to grow, John and Nancy realized they needed to add a partner to their business as well as a successor to the firm. They wanted to add a funeral director who lived in the community and was also a well established owner as well. They chose Mario Billow from Enola and he has become a perfect fit. He is a member of Our Lady of Lourdes Catholic Church where he serves as a Eucharistic Minister and is a Knight in the 4th Degree. Mario is also actively involved with the Capitol City Sons of Italy Lodge, Northeast Fire & Rescue, West Shore Elks, East Pennsboro Stormwater Authority, East Pennsboro Industrial & Economic Development Board, LeTip of the West Shore, National Funeral Directors Association, PA Funeral Directors Association, the Capital Area Funeral Directors Association, and the Academy of Professional Funeral Service Practice where he achieved the designation of Certified Funeral Service Practitioner (C.F.S.P.). He is a graduate of West Perry High School and a U.S. Army Veteran serving in the 6/29 Field Artillery 8th Infantry Division, Germany. He earned a Bachelor's Degree in Business Administration from Central Pennsylvania College and a degree in Mortuary Science from Catonsville Community College in 1994. Mario was also a hospital mortician for the Milton S. Hershey Medical Center assisting families at the hospital as well as the pathology staff with the daily activities of this prestigious trauma center. Locally he is known as an expert embalmer, and many funeral homes in the area contact Mario to assist them. Mario is also an award winning amateur winemaker and has entered many of his homemade wines in national competitions. Mario is married to Windy Juliana (Bohensky) Billow and they are proud parents of their daughter, Maribella Dawn Billow. Josh and Leslie joined our funeral home in 2017. Leslie is our Secretary at the funeral home and Josh assists us with funerals, viewings, and when we bring your loved one into our care. Josh is the Fire Chief for Northeast Fire and Rescue as well as the Assistant Fire Chief for East Pennsboro Township. Leslie is also actively involved in the fire company. They have 2 children, Bree and their most recent addition, Landon. We are truly blessed to have this husband and wife team as part of our staff. Charles has been with our firm since 2013 and is a graduate of East Pennsboro High School and Community College of Baltimore County's Mortuary Science Program. He served his internship with our funeral home and obtained his license in 2018. He is a member of the West Shore Baptist Church in Camp Hill. Joseph and Maria Penkala are members of Our Lady of Lourdes Catholic Church and are actively involved in the community as well. Both Joe and Maria help us with funeral services and community events. Kelly is a Certified Grief Counselor and has been working for Hospice for over 20 years. She has also been certified in Critical Incident Stress Management which focuses on trauma, suicide and sudden death. Jim and his wife Carol are also valued members of our staff. They are members of Our Lady of Lourdes Catholic Church and are very active in the community as well. Jim and his wife serve our funeral home as assistants and provides a caring service to our families. 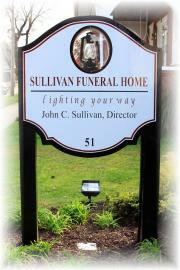 At Sullivan funeral home, we take tremendous pride in the history of our community. From the Enola Railyard, the Boyer Farm where Central Penn College is located; to the scenic areas along the Conodoguinet Creek, our residents can see the history all around us. Because of the importance of the Enola Railyard's location here in East Pennsboro, our funeral home felt it was important to capture that piece of history by creating our logo of the antique railroad lantern. When you drive past our facility at night, you will see this lantern lit within our sign, "Lighting your way" to our facility and through the difficult process of planning your loved one's funeral.